In late June 2018, I departed Hong Kong for Thailand in a group of 34 travellers. At the Suvarnabhumi International Airport, we were joined by some others from US, Canada, Guangzhou, etc. The Venerable Guan Cheng, the Venerable Hong Yao, Mr. and Mrs. Som Chai from Thailand and their team were already expecting us at the arrival hall. All of us were high-spirited and eager for “The Meaningful Charity Activity at the Murrah Farm in Thailand “. Our journey began with a nice group photo session. This loving and caring event is now in its fourth year, thanks to the unfailing support of Mr. Chai, a prominent Thai Chinese entrepreneur, and his family. All aspects of the itinerary, including accommodation, catering and transportation, were well organized with all the thoughtful arrangements to ensure a seamless journey. And last but not least, we are all indebted to the compassion and appeal of the Venerable Guan Cheng; without which this charitable event would not have taken place. The second day upon arrival in Bangkok marked the highlight of the event. After our morning recitation, the Venerable Guan Cheng took us to the Murrah Farm to visit the home for the old age buffaloes – a place where these animals would enjoy their declining years; and to perform for the 19 buffaloes which had just reached “retirement age” the rituals of water purification, taking refuge and developing affinity. We arrived at the Mini Murrah Farm for lunch at noon. This was an en route stop where the Venerable Guan Cheng introduced to us the farm owner Ms. Runchuan Hengtrakulsin as well as the story behind the home for the old age buffaloes. In 2014, the Venerable Guan Cheng had met Ms. Runchuan through Mr. and Mrs. Chai and chatted to learn that the farm produced buffalo milk and cheese. The buffaloes were usually raised and kept to serve the farm for more than ten years. But when the old herd grew older and weaker, and were producing less milk, they would be sold off to the slaughterhouse. What happened to these buffaloes triggered the compassion of the Venerable Guan Cheng, who could not bear to see the helplessness and misery of these animals at the end of their lives after a lifetime of hard work and loyalty for the mankind. This inspired a plan for a life liberation sponsorship scheme for the old age buffaloes so that they could spend their remaining days in nature happily to avoid being killed. The Venerable Guan Cheng’s plan gained much support from the Chai’s family and some friends from Thailand, along with the ready collaboration from Ms. Runchuan. To date, the scheme has successfully sponsored and rescued a total of 72 buffaloes. This year alone has witnessed the retirement of 19 buffaloes who became new joiners to the home for the old age buffaloes. This buffalo rescue action is different from the usual life release events in which fish and birds are set free to the ocean or the sky without any follow-up actions, so whether the animals, once released, will be able to cope with their new surroundings and not become traumatized can depend on nothing but their karmic connection. The buffalo release and protection scheme at the Murrah Farm is characterized by its continuity and sustainability. Donors of the scheme can visit the farm in person, and see for themselves the living environment, the hygienic conditions and facilities of the home for the sponsored buffaloes. The scheme also makes room for improving fodder supply and the quality of life of the old buffaloes. 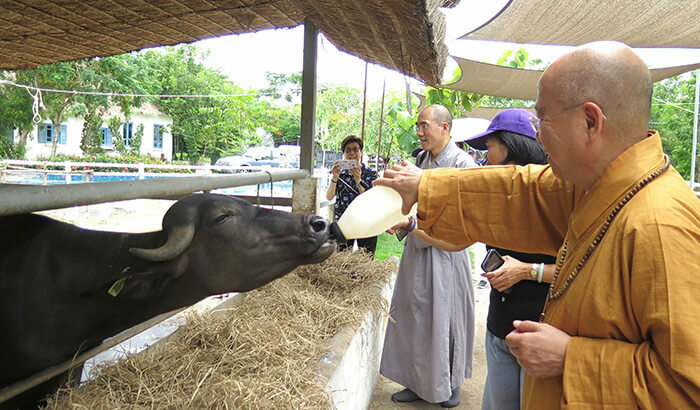 With the establishment of this home for retired buffaloes, it is the wish of the Venerable Guan Cheng to provide hospice service to the sponsored herd, and also to instill in us the necessary care, sympathy and mercy to animals (not only buffaloes) and all beings (sentient or else), in order to achieve the Six Paramitas. After a sumptuous vegetarian buffet lunch, we visited the Mini Murrah Farm. Besides buffaloes, we also discovered other adorable residents, such as rabbits, goats, deer, pigs, ducks etc. It was consoling to learn that these animals are guests of the farm to appreciate and take photos with, rather than being killed for our meals! Since collaborating with the Venerable Guan Cheng on this sponsorship scheme for buffaloes, the farm owner Ms. Runchuan has been deeply influenced by the Buddha’s teaching of compassion and started promoting vegetarianism in her farm restaurant. In all, the farm, though small, has impressed us with much thriving, love and positive energy. Departing from the Mini Farm, we set off for the real home for the old age buffaloes. After about 15 minutes’ drive and a good walk, we finally reached the haven for the old herd. The old buffaloes showed no signs of fear for strangers, and actually gazed at us with affability, as if they realized the purpose of our visit. The 19 old “new joiners” for this year have been settled in their position and were ready for us to perform water purification and taking refuge under the guidance of the Venerable Guan Cheng. All ritual procedures, including the wearing of ceremonial robes and outer sashes, were performed to protocol and completed with dignity and solemnness. During the ceremony, the old herds were calm and cooperative. We were happy but reluctant to part with them. As soon as the ceremony was over, we were already looking forward to visiting these old friends again next year. The mission of this journey was now accomplished but more was awaiting us. To keep us from distraction and being carried away by dissipation and too much amusement, the Venerable Guan Cheng had arranged for us instruction sessions in the evening in addition to the morning recitations, so that we could adhere to dharma and keep up with self-cultivation. 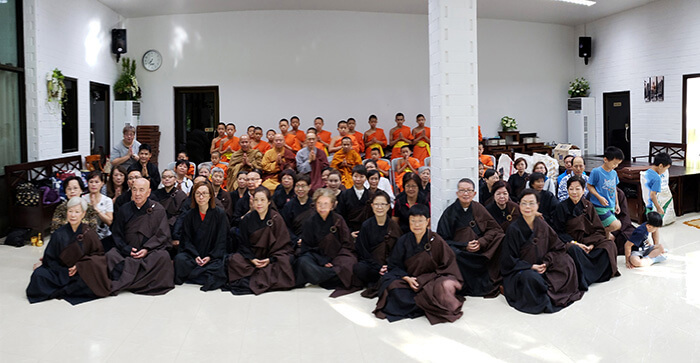 The journey ended with a brief stay at Baan Sawang Jit (素心苑) – an elegant place of seclusion away from disturbance where we could practise meditation. Here, beauty and peace were filled with fresh air. We were surrounded by luxuriant flora and giant trees which made us as one with nature. It was in this tranquility that our mind was free of hindrances and that we could easily leave aside all our worldly thoughts and practiced meditation. Given what I have learnt and experienced, this 5-day journey, though brief, has been very exceptional indeed!